Range of cylindrical cased axial fans fitted with aluminium impellers and manufactured from high grade rolled galvanised steel and protected against corrosion by cataforesis primer and black polyester paint finish. Fited with 2 contra rotating complementary impellers manufactured from die-cast aluminium. Available with single or three phase 4 poles motors. 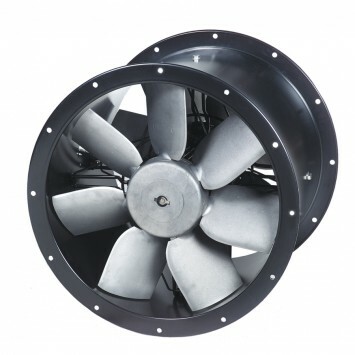 All the motors are IP65, Class F insulation (1), equipped with thermal protection. Single phase motors are variable voltage (Excepted TCBBX2/4-630). (1) Working temperatures from -40ﾺC up to 70ﾺC.